Gift giving stresses me out big time. I spend way too much time running around and deciding what to get people, feeling like my mind is a blank slate. I am awful at it. Small gifts is not my love language. Occasionally I have pockets of inspiration, and I feel like queen of the world when I discover (or make!) a great gift that someone appreciates. 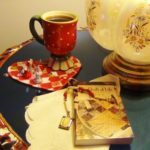 Reading Marie Segares’ post last year on 7 Tips for Getting a Head Start on Holiday Crafting and DIY Gifts seriously helped me reframe how I view gift giving and holiday crafting. I highly recommend giving it a read! One of the 7 Habits of Highly Effective People is to Be Proactive, and that applies to Christmas crafting. We have a matter of weeks before the holiday is upon us, and if handmade projects like knit and crochet patterns take 1-2 weeks to complete, well, you can do the math! Starting now allows time to pick your projects, take breaks, make mistakes, fix them, and finish your presents. Marie Segares talks about deciding who will get handmade gifts, and then planning what to make for them. Getting organized and writing out a plan (or pinning the projects you’d like to make, or crafting your plan in any manner of your choosing) will help you visually see how much time you have and how much crafting there is in store! My norm is to sit down and make as many scarves as possible (like my absolute favorite infinity scarf pattern by Fiber Flux, linked on AllFreeCrochet) and choose recipients after I finish the scarves. This is not the best method. It is, in fact, a terrible method. Be intentional with your gift giving and plan out your gifts and your recipients! Maybe that crocheted afghan you wanted to give your best friend isn’t going to happen in time. Maybe you can’t knit 16 pairs of slippers before December 25. That’s okay! 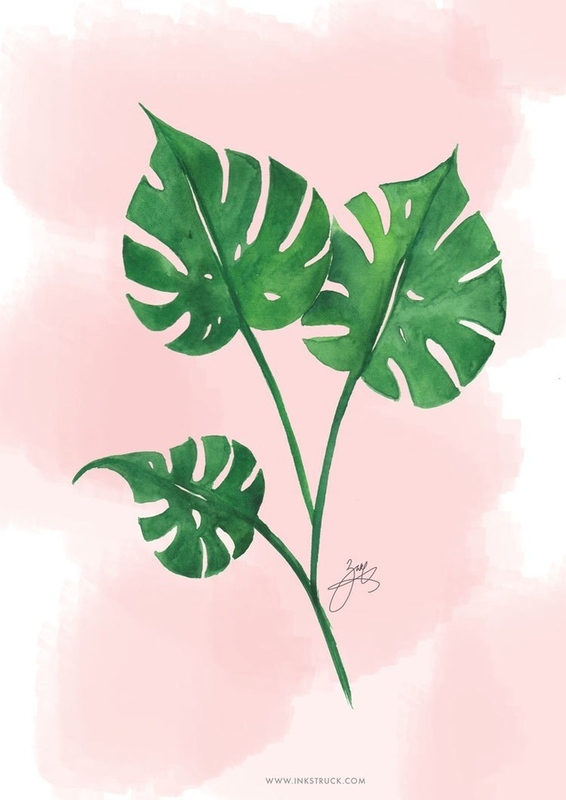 Be gentle with yourself, and consider an alternative like free printables for making wall art, quick knit or crochet projects, and any of the ideas below! If all else fails, a store bought item or gift card never hurts. Easy Dishcloth Knitting Pattern – fan favorite! 55 Adult Coloring Book Pages – put them together for an easy gift! 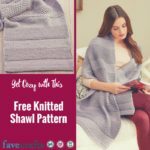 Lately, the editorial staff here at FaveCrafts.com has been working hard on creating extensive how to articles to help our readers out with basic crafting projects and solve every day creative problems. These crafting tutorials not only come with charming DIY craft ideas, but allow you to make the best of crafting materials, your creative space and more. 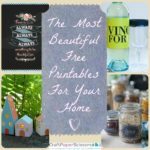 Whether you are brand new to crafts or just looking for some tips you may not know, the articles below are helpful and perfect for saving for later. This smart list will serve as a resource you return to time and time again. Coloring Book Therapy: Fact or Fad? What crafting questions do you want us to answer? Last year, we launched a brand new program for our bloggers and designers to submit their projects to our site. Years ago when FaveCrafts first launched, our editorial staff had to manually upload every single project submitted to the site. That meant a lot of work on the editor’s end and a lot of waiting for the blogger. Luckily, we just keep getting smarter here at FaveCrafts.com and Prime Publishing LLC (our home!). In hopes of improving our speed, efficiency, and personalizing the process, we launched our Submit Your Craft program. Now our bloggers can upload all of the information for their craft. By providing the description, photos, and more for projects, our designers have delighted in this new process. So far 1,569 projects have been submitted to FaveCrafts alone. In total all of our crafting and cooking sites at Prime Publishing LLC have received 15,369 projects and recipes! Now, we’re looking for even more projects! Check out the tips below from the FaveCrafts editor (that’s me!) 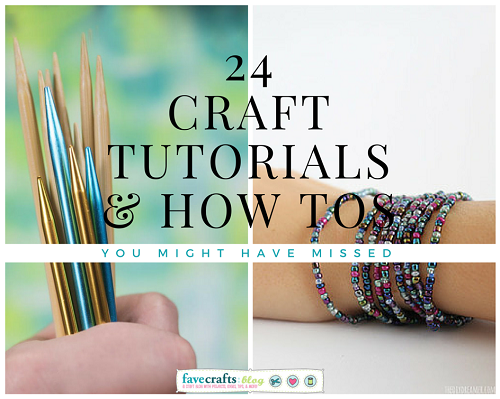 on how to submit your projects to FaveCrafts and starting sending your ideas our way! 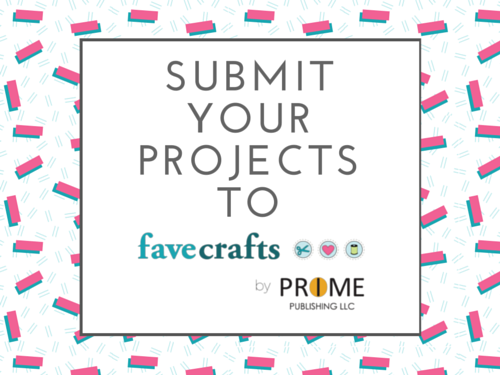 In order to submit to FaveCrafts, you need to head on over to our Submit Your Project page and click the “Share Your Project” button! 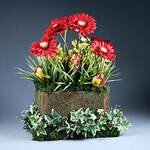 You will be prompted to choose a type of craft, simply choose the craft project that fits your link best. If you are submitting a general crafting idea, select the “Craft Projects” button! Next you will be prompted to name your project. Name your project something that is easy to understand and relevant to our readers. We recommend names that are a max of 4 words long. You may also choose a category on the site to place your project. If you’re unsure, leave it blank. Our editors can do that part for you. Next, you will be prompted to upload an image. You must upload at least one image for any and all projects with a minimum size of 500 x 200 pixels. Please try and upload your best quality photo. Additionally, we prefer photos without words or watermarks on them. This makes it much easier for us to feature these projects in our newsletter, blog posts, and collection pages. You may upload multiple images. In fact, we encourage it! Now you will be asked for a description of your project. This description must be at least 50 words long. Get creative here! Remember you are tempting people to click on over to your site or make your project. 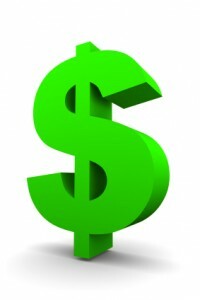 Sell your project! From here on out, the information will changes from project type to project type. Fill out these questions to the best of your abilities. If you don’t know, simply skip it! Some fields (like difficulty level) are required. You will be prompted to fill it out if so. If you want us to link out to your project, insert your link into the HTML link section when it pops up. This must be a direct link to your project and not to your home page. We do not link out to company projects or links. Company projects should be submitted to us in full. When your project is added to the site, one of our editors will reach out in regards to creating a branded profile for your company. After this you will be asked for your materials list and instructions. If you prefer not to provide this information, you can skip these steps. 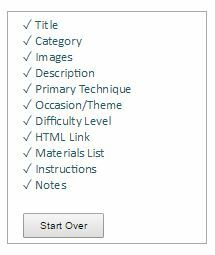 Hint: If you are looking for a link to your blog, we recommend still providing a materials list as many crafters are more likely to visit a link if they know what they need for a project. In the notes section, feel free to leave any additional information about your project. Additionally, you may leave any special instructions for the editor here. Before submitting, you will receive a preview of your submission. If anything is wrong, feel free to click on the section list to the left of the preview to return to a tab and fix the issue. Once everything looks okay, click “Save & Continue”. Finally, you will be asked for your name and email address. The name you fill out here will be the name that shows up on your byline on the site, and the email address provided here will be the one we use to contact you when the project is posted. We recommend using the same information for all of your projects. Find even more helpful tips and tricks on how to submit your project to FaveCrafts in our Submit Your Project FAQ. This helpful list of frequently asked questions offers helpful hints on the submission process as well as some fantastic tips on what type of projects, project names, and submissions do well on out site. What kind of projects would you love to see submitted to FaveCrafts? As you age, your body changes. This is especially true for your vision, hands, and overall coordination, some of the most essential parts of knitting and crocheting. While you may have learned how to crochet years ago, the truth is that sometimes with age you have to relearn how to crochet or how to knit in a more convenient and comfortable way. Aging does not mean you have to give up your favorite hobbies, but making some adjustments to your techniques can make the whole process much more enjoyable. 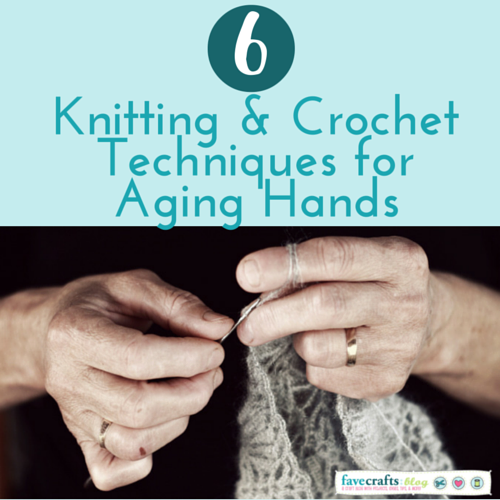 Check out the 6 Knitting and Crochet Techniques for Aging Hands below to learn about some adjustments you can make to your crochet patterns and knitting projects to make them easier and more enjoyable. 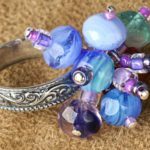 One of the biggest gripes we hear from our audience when it comes to aging and crochet and knitting projects is that hand and wrist fatigue increasingly becomes an issue. Sore wrists and cramped hands can turn the cutest crochet project into a painful process. Look out below for our surprisingly simple solutions. Add light and a magnifier to your space. Adjust your crochet space to add more light and invest in a magnifier. While it may not seem like sore eyes are directly connected to wrist paint while crocheting, this extra issue can really affect your whole process. 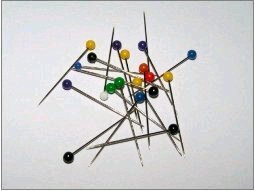 Crocheters and knitters who squint may be inadvertently adding tension to their hands as the struggle to see what they are doing. Plus, pausing in uncomfortable and unnatural positions due to poor lighting can easily cause over-exertion. Make sure to stretch your hands before, during, and after you work on your projects. No crochet technique in the world will make the project easier if you do not take care of yourself. Give your muscles a fighting chance by warming them up each time you crochet or knit. Stretching amidst a hooking or purling session can help too. Consider learning some new stretches or trying yoga for your wrists and hands if you are especially sore. The reality is that the more wear and tear your hands receive, the more time they are going to need to recover. This means giving yourself more time to finish projects. Don’t plan on sitting down and crocheting that 2 Hour Pot Holders pattern all the way through in an afternoon. Break up the time you spend crocheting or knitting into smaller segments. Basic and simple crochet hooks can be too small to grip for an extended period of time. Make sure you spend the money on crochet hooks and knitting needles that add some comfort to your crocheting. 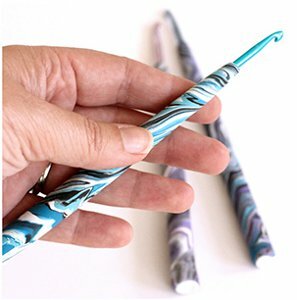 We recommend buying or making your own knitting needle or crochet hook polymer clay crafts. Adding a softer, bulkier handle to your tools can work wonders. Skip the super intricate projects. We all know that crochet patterns with thinner yarn and tinier needles are much harder to make. You should avoid these more intricate projects or, at least, work on them a lot less frequently. 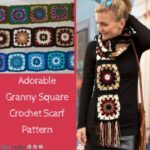 Bulky and chunky knitting patterns and crochet projects can be created a lot more quickly and require much less intricate, hand-hurting work. Aging can be a tricky process. It can be really hard to admit that sometimes you are just not capable of doing things as quickly or as precisely as you used to. Above all else, remember to be kind to yourself. While it might be a bummer to crochet a little less or work on easy knitting patterns instead of impressive intermediate endeavors, remember why you started creating in the first place. You can find as much joy in an hour of crocheting than you used two in three hours of hooking. Check out these easy crochet patterns that make you crochet experience easy peasy and beginner knitting patterns that are gentle on your hands. Use the knitting and crochet techniques above with these free project patterns we love. Did you learn to crochet when you were younger or later in life? 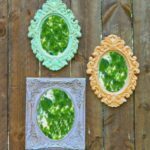 I’m Marie from Underground Crafter, and like many crafters, I love to make handmade gifts for the holidays. Not only do I get to express myself creatively, but also can often make higher quality DIY gifts than what I can usually afford to buy for my friends and family. I’m also not the only crafter who has ever become overwhelmed by making gifts for the winter holidays or has lost sleep, gotten a repetitive stress injury, or just became annoyed with the demands of handmade gift giving. To help make this year’s holiday crafting more pleasurable, I’m sharing 7 tips for getting a head start on holiday crafting. This one almost goes without saying, but start your holiday crafting as early in the year as possible. You will give yourself more time so you can work at a leisurely pace, or you can choose to make gifts for more people on your holiday list. Not everyone appreciates handmade gifts, and others may not be fans of your favorite craft. The holidays will be more fun for you (and for the recipient) if you focus your efforts on making gifts for those who will actually enjoy them. I call these people “handmade-worthy” recipients. As you think about all the people (and pets) you may consider making gifts for, narrow your list down to those who would appreciate something handmade. These are usually the people who have had kind things to say about your crafting, who are makers themselves, or who have worn and used previous handmade gifts. Now that you’ve eliminated those who aren’t “handmade-worthy” and know everyone you’d like to make gifts for, make a list of the types of gifts you’d like to make for them. 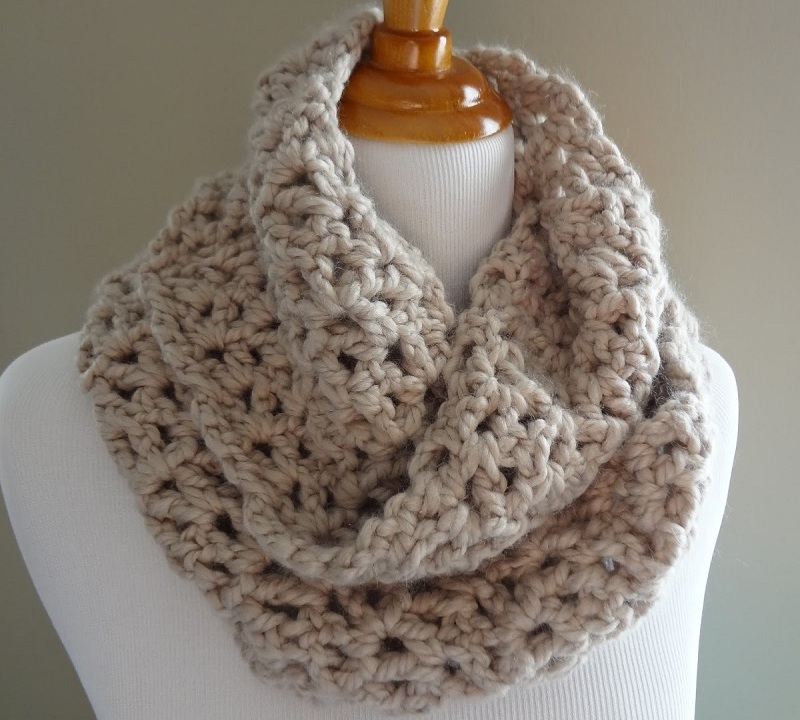 Some crafters make variations of the same project for everyone on the list (like a favorite knit scarf pattern in different yarns) while others like to make a completely unique gift for each recipient. Most of us crafters already have a stash of supplies. Look through your existing stash and compare it with the items on your project list. 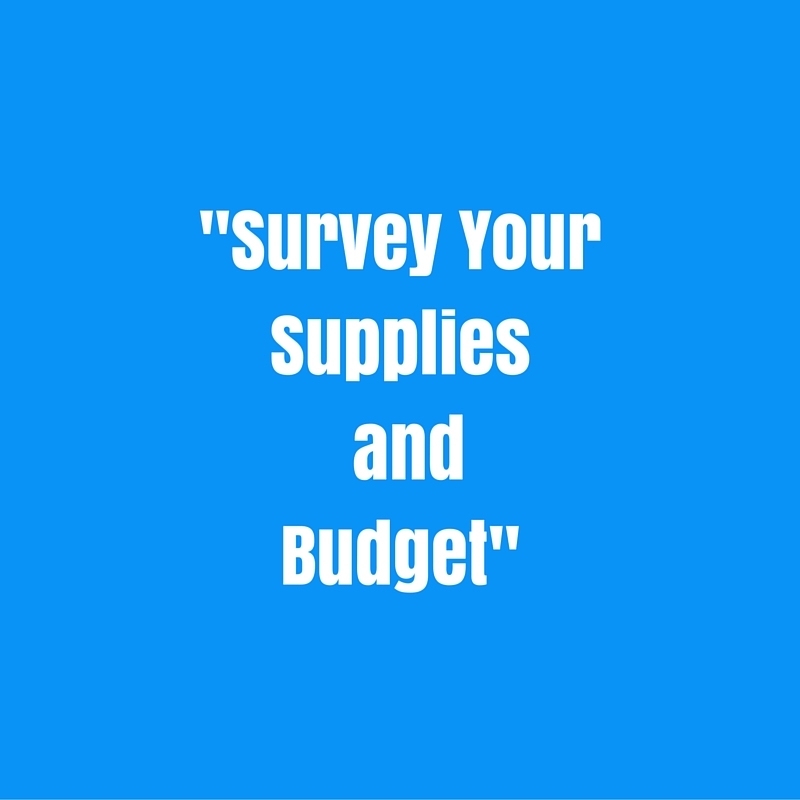 Now take a look at your budget to decide when and if you need to purchase any additional materials. In my experience, overestimating the availability of time is the most common struggle crafters face when working on handmade holiday gifts. While we could all make unlimited gifts if we had unlimited time, the reality is that as each week moves by, our holiday gift deadlines become narrower. So, be realistic about how long each project will take, and consider revising your list based on the amount of time available. Even when you are working towards crafting deadlines, be sure to take care of yourself. 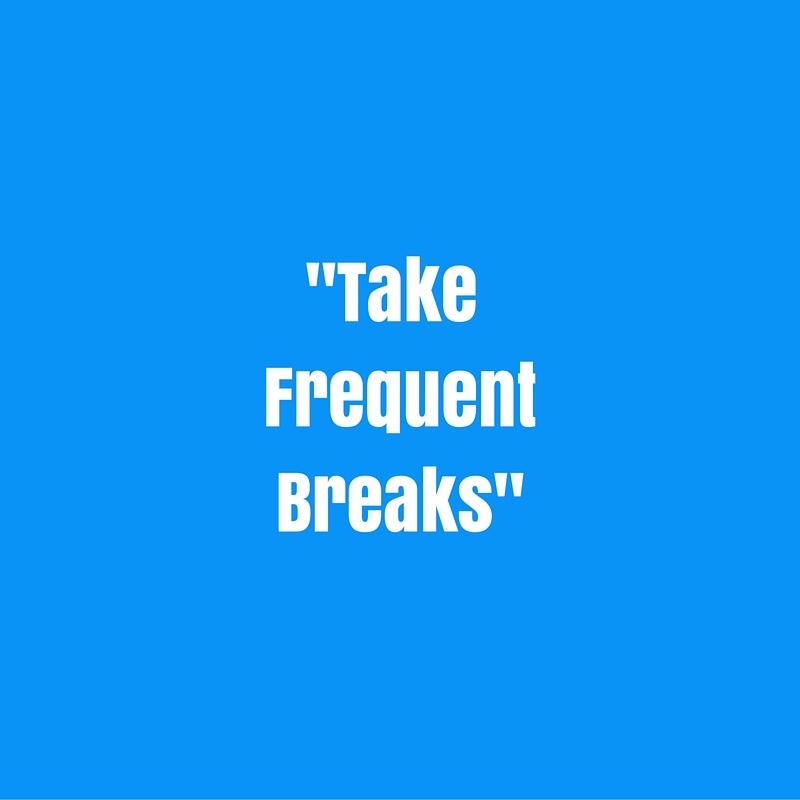 Take frequent breaks (every 30 to 90 minutes, depending on your craft and the intensity of your work) to stretch and rest your eyes/hands. This will help you avoid repetitive stress injuries. Sometimes, even the best plans go awry. Have a backup in case you can’t finish your projects on time. This might mean putting aside money to purchase gifts later. 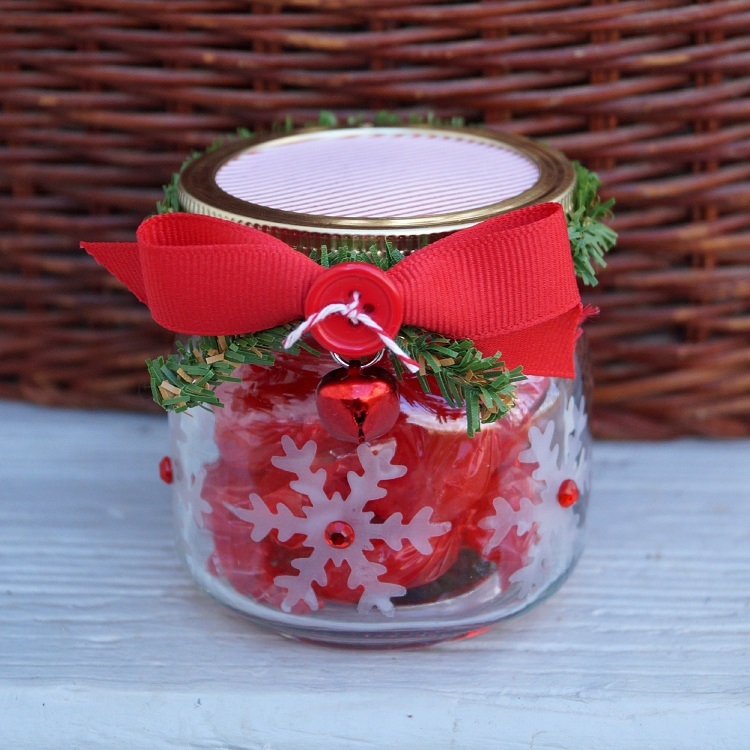 You may find virtually working alongside other crafters on holiday gifts makes the entire process more fun. Look for holiday make-a-longs on your favorite social networks. If you crochet, join the Holiday Stashdown Crochet-a-Long which includes 15 free crochet patterns by 15 designers. How to Photograph Craft Projects + Awesome Giveaway! For the majority of us, our smart phones are our go-to tool. Not only are they phones, but most now can surf the web, pay your bills, store your music, and even act as a high-quality camera. Gone are the days of poor photo quality…today’s cell phones have the ability to take amazing photos and upload them directly to your social media site of choice. First, let’s talk about some basic photography tips that you can use when it comes to taking photos of your craft projects. Most of us don’t have the luxury of having professional photography equipment lying around the house…so we have to make the most of what we have available to us…in Quick Photo Tips: Do What You Can with What You’ve Got, you can learn how to use the tools you have available to you to create amazing photos of your work. Learn how to set up a photo studio and where the best places in your house are to take your photos. Once you’ve set up your studio, read Lights, Camera, Action: How to Light Your Photos and Displays for helpful suggestions on how to shed just the right amount of light on your project. 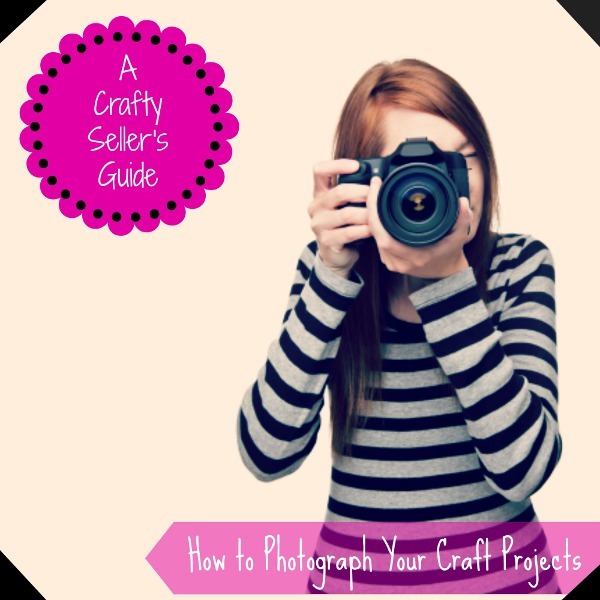 We also suggest reading How to Photograph Craft Projects: Photography Guide for Selling Your Arts and Crafts Online for a great step-by-step guide for making your projects stand out above the rest. Finally, it’s time to edit! We suggest using PicMonkey to edit your photos, as you can easily edit one sigular photo or arrange several photos into an amazing collage! Not familiar with PicMonkey? Check out our series on how to use this free photo-editing software! Bonus! We want to help you create the best photos you can…so we’re giving away 1 Lightcase to 5 lucky winners! 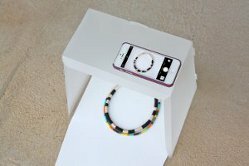 The Lightcase is a pop-up photo studio that allows you to take professional-looking photos with your smart phone. Great for photographing anything from small craft projects to new, exciting recipes, the Lightcase is a must-have for hobbyists of all kinds! You have until May 19th to enter…click here to enter today! This tip from one of our designers most likely resonates with a lot of you. Whether you were the victim of your sewing machine or have feared it for most of your life, here’s a tip. 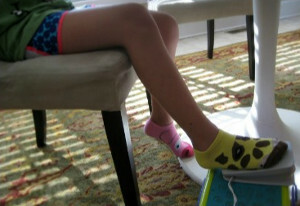 Prevent any damage inflicted by the dreadful sewing machine onto your children. Who among us doesn’t loathe threading? 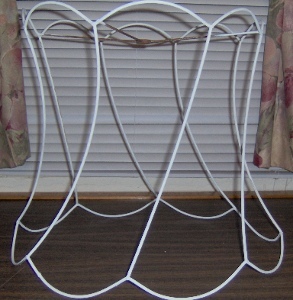 If you like it then you should volunteer your services to other sewists out there. Try out this sewing tip to tackle those threads. This is a great tip for beginner sewers. You’re not going to like this answer; but when you loose electricity and you’ve got a deadline to meet, it’s time to hit the fabric old-school style. Grab a thimble because hand sewing is your best bet for sewing success. 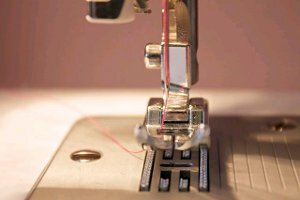 Luckily, we have some much loved hand sewing advice for you. Some of our sewers are at this very moment unable to access their sewing supplies. This could be because of a move or because of no room. We feel for you. Put these organizational tips to use when you do get that fabric out of your storage unit. Hang in there! Grandmas out there, the only true way you won’t have to do this tedious sewing project is by hiding your sewing abilities from your grandchildren. However, if you are stuck in a bind and need to make the apple of your eye some itsy-bitsy clothing, we have some doll’s clothes on our site. We were surprised to see that some of you feared adding a zipper to a project. Admittedly, a lot of us used to fear that too, but thanks to some crafty advice that fear is conquered. Check out these tutorials that tackle the toothy zipper once and for all. Ouch. Nothing hurts more than the startling rediscovery of a long lost needle…in your foot. Try out this sewing tip for preventing needle injuries and keep you and your family happy. Some of you were afraid of losing inspiration for your sewing projects. 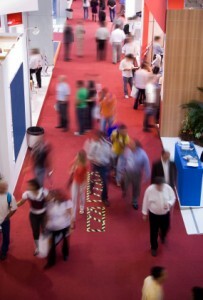 We can easily help you there; if you visit our site you’ll never be at a loss for projects ideas. 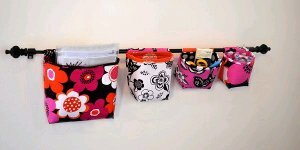 Remember to check out our tips and tricks section on AllFreeSewing for sewing safety advice. 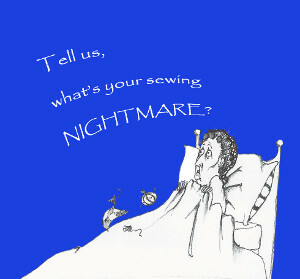 Also see our Facebook page to find our post about Sewing Nightmares and see specific stories from your fellow sewers. What’s the best sewing advice you’ve ever received? Your answers could appear in an upcoming Creative Income newsletter – subscribe today!